This facility is situated in room 02 AA 02 (level 2) [recently relocated to this room]. It is based on a self-help package called HELM (Help Engineers Learn Mathematics) developed at Loughborough University. It consists of workbooks that cover virtually all the Mathematics you will cover in levels 1 and 2 of your degree in engineering. It is available for the use of any students in FEPS. MathCal, developed at Surrey, is also available on the desktop. There are 4 levels (A, B, C, D, E) of usage of the facility as outlined below. These may change after the room has been in use for sometime. The room will be accessible 24 per day (unless prebooked), via swipe cards (your union card) for out of hours access. You will then have full access to the HELM software. Connection to the Web is not permitted in the room, nor is the use of WiFi. You may not use the room when there is a timetablled class on (see C and D below), irrespective of the size of the class. Please sign in and out in on the sheets provided to help us monitor the use of this facility. You can have Postgraduate tutorial help with the problems in HELM or any other mathematics problems. In the Electronics Department, the booking will be in half hour slots and the Tutor will be a postgraduate. Specific PCs are set aside for this purpose but any other free one may be used. TWO DESIGNATED PCs HAVE PRIORITY FOR 1-1 TUTORIALS. These are PC 17 and PC 18. 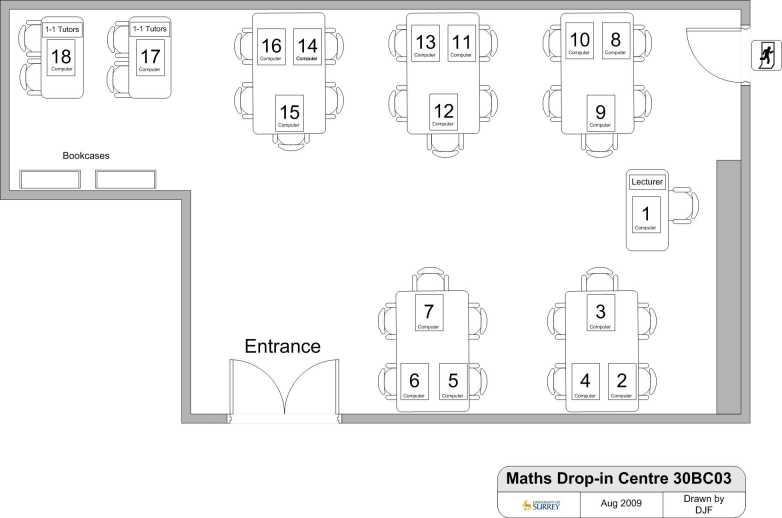 See room layout below. Undergraduates should contact one of the PGs on the list below to arrange a mutually convenient time. But, you may not use the room when there is a timetablled class on, irrespective of the size of the class. No signing in is required. These are timetabled slots when Postgraduates, appointed by their Departments, are available in the Drop-in Centre. Tutors and students do not need to sign in but tutors should keep a record of attendance for use by their departments. Different from usage D above, however, that casual (drop-in) is allowed in such manned sessions provided the users do not interfere each other. No eating, drinking or smoking is allowed in the room. Individual users, please sign in and out, and give your Department and level so we can monitor the usage. Web access (email, surfing etc.) and WIFI use is prohibited. Please do not move the PCs around and remember to shut down after use. For 1-1 tutorials when signing in, please give the name of the tutor and for the students, their name, department and level. For timetabled classes/group tutorials, no signing in is required. None of the textbooks provided may be removed from the room and please return them to the shelves after use! Failing to observe these rules will result in a ban of the use of this facility. Some students are already at risk! Please note we now monitor the room and the system. Some of the interactive material on HELM has audio so you are advised to take headphones along. The HELM interactive material has already been placed on our server from the Loughborough site. Please shut down the PC after use. The room will be open from 8am to 6pm.